It’s week 41 of the Marketing or Romance Writer Blog Challenge. This weeks topic is blogging inspiration. My post will be very short as I am not very inspired to blog.Truth be told, my heart’s not in it anymore. I never know what to write about that will draw readers. I have tried umpteen things but all a fail. So my blogging inspiration is this MFRW challenge. I have managed all but one week and that was because my computer was broken and I fit it in the next week. I do post an occasional spotlight and review for a few friends releases. I hope soon to begin posting a teaser again once I get more of my story edited. That’s my inspiration. what’s yours? Any tips to inspire me? now let’s go see what inspires the other bloggers. I tried an A to Z blogging challenge once; I think I got to “N”. I applaud you for trying twice 26, in a 52 week commitment. As for inspiration, both personal relationships and experiences I’ve had while traveling prompt me to write. Encouragement from friends and competitions like NaNoWriMo help to. Have a great weekend, Cathy! Oh Tricia that A-z was a bugger lol . This has been fun. I do NaNo as well but otherwise I am stuck. It’s hard to know what to write that will interest people. 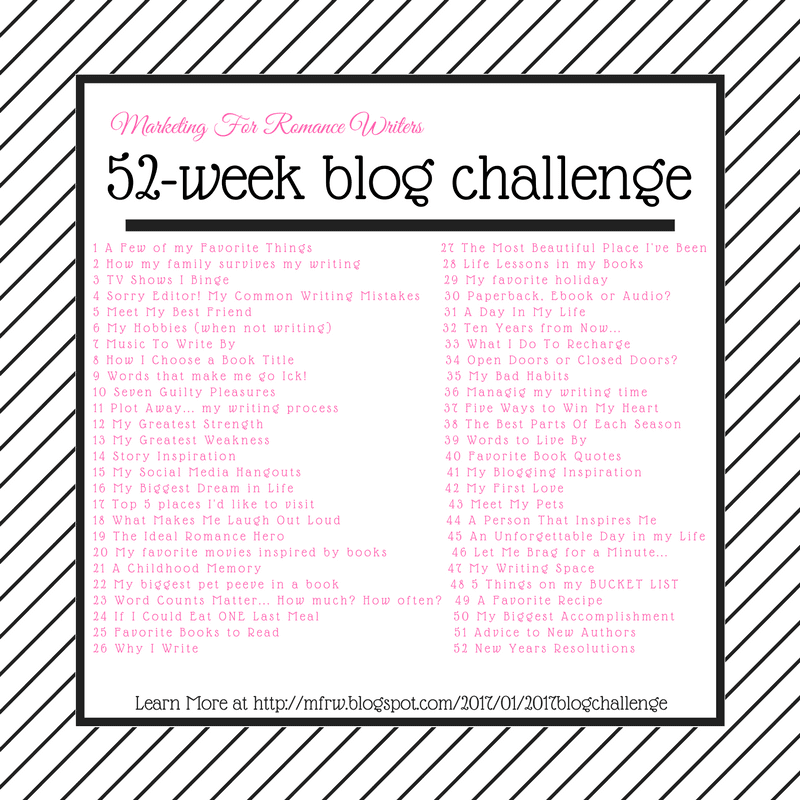 The MFRW blog challenge prompts have provided me with more inspiration this year as well. Nothing wrong with being honest. I’m the same way at times. I have to want to talk about something and if I don’t, then I won’t. I sympathize completely! I’m in exactly the same boat. Hopefully we will both find the time snd work it out! was in the habit of blogging every day but once Jemmik was born I wasn’t doing that I’ve never quite gotten back to it. I’m like you. Blogging doesn’t come easy or natural. If I’ve been more consistent this year it’s because of the challenge. It will be interesting to see if it translates to expanded followers or more sales. Something I’ve learned through this challenge is to get out of my own head. I may not think I have something to write about, but I’ve seen an uptick in blog traffic, so I must not be too boring, lol. I’ve enjoyed reading your posts this year – hang in there! Thank you Robin! I signed up for your blog and your new book looks right up my Alley! It’s a struggle for me, Cathy. I had to create topics to write about as a reminder to blog. This blog hop has helped, but being so busy with writing, it’s hard to find time. Congrats on only missing one week of this blog challenge, but, hey, you made up for it the following week. Thanks Mary this has been good for me. I am going to try more things next year but hoping things to draw attention to my work. Thanks for sharing, Cathy. I have been blogging since 2005 and have yet to create a following! My Asian Dramas blog is that old and only 21 followers but lots of ‘views’. I get discouraged lots, but I still can’t help wanting to blog, so these types of challenges really work for me. Maybe more people are ‘reading’ than responding, like in my case. LOVE the Halloween theme, too! Thank you Raine. When I did blog I had at least three that read and commented regularly a few likes. It’s possible more read like you said. Once I get this book ready for publication I plan to figure out s few more days a week.at least one a week with teasers or snippets. For someone who’s not inspired to blog, you do a great job! Thank You Ed! That means a lot! We all have blogging dry spells, and I applaud you for the regimen of weekly topics. Man, that is hard. You always write such interesting things though. You’re good at it! Thank you. I hope to going back to a couple posts a week soon.